This is an amazing place! 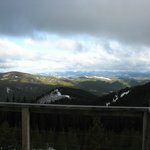 Bears and views and wild trees and superb food prepared by a friendly couple that you can just tell love the area. If you want to be on vacation, this is a definite place to visit. Mountain ranges as far as the eye can see. If you enjoy being in the quietness of beautiful mountains, this is the place to be. Mountain lakes are close and the view is amazing! Relaxation at its finest. The lodge is well equipped for those that love to enjoy good food with good company. Definitely would visit again. A fabulous place for solitude and relaxation !!! The surrounding forest invites exploration and offers an alpine lake on the lodge property. World class biking with MANY miles of forest roads and single track trails. We rode for two days and saw only Montana wildlife. At the lodge expect very comfortable beds, a hot shower with fantastic views and great food. Retire to the deck after a long day on the trail and enjoy your favorite libation while taking in the endless views. Very impressed! We would love to go again !! Way they all should be!!! This is a fantastic location/vacation cabin. The views are amazing, and Denison is extremely friendly and accommodating (and a fine cook). Access is a beautiful 2 hour ski in in the winter time, or you can drive up in the summer. Once there, you have all the rustic charms you would expect of the best "off the grid" lodges, including sauna. 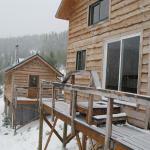 The lodge is surrounded on all sides by national forest, giving you a feeling of complete seclusion. The access to fresh powder is right out the door, or you can sit back, and relax in front of the wood burning stove, watching gorgeous sunsets off the deck. I would highly recommend ARL to anyone who wants to get away from it all, get in a few turns, or just spend a relaxing weekend, unplugged. Starting with the turn off the highway into Maxville, this is an authentic Montana experience. A few more miles up a dirt road, a few more on skins, and the lodge pops out of the trees below Birthday Ridge. Great views into the Bitterroots to the west and Pintlers in the south. All the ebullience about sunsets on the website is totally true. A few friends and I went in for a three days of skiing. 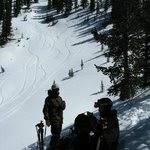 There's terrain for everyone: mellow trees, steeps, couliors, pillows, close shots twenty minutes from your bed, and long trips if you like to walk. Nothing quite like an awesome day of touring to roll back in to dry out your gear, beer, dinner, and soak in the sauna. Don't try to Google Earth it to get a feel; there's way more than is shown. Food is top notch. Lots of comfy beds. Denison pulled out all the stops and we have him to thank for an excellent stay. Certainly going back next season.